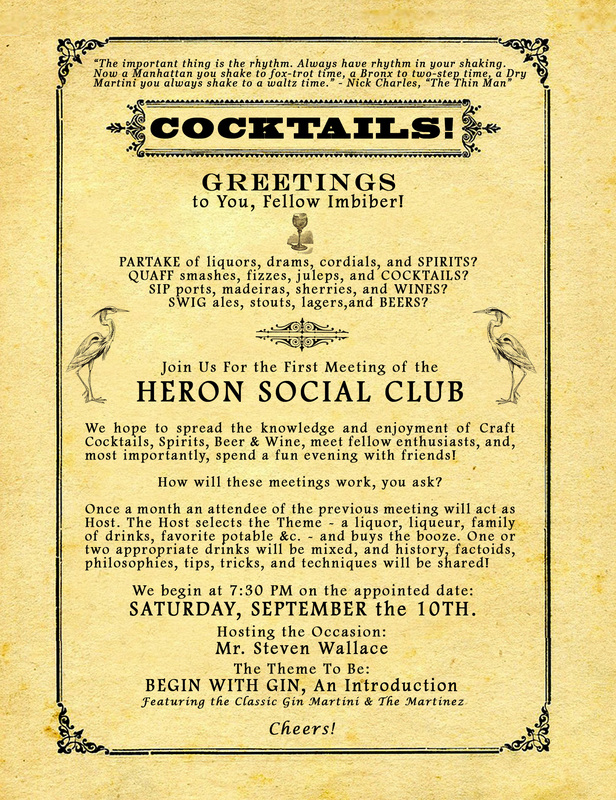 The Heron Social Club or Chandler Pond Cocktail Night, call it what you will, will be a monthly gathering of a few friendly neighbors, during which we’ll mix up a drink or two, talk a little bit about history and mixology (Learning! Good Heavens! ), and generally have a good time. These nights will also be mixological proving grounds, open for experimentation. Ice block carving? Sure. Home-made infusions? Why not. Original drinks? Certainly. First, however, the basics have to be covered. We would like to have a theme for each meeting to give them a bit of focus. The initial meetings could, perhaps, cover the base spirits, but with so many holidays thrown in at the end of the year we’d hate to pass up the boozy opportunities (Spooky concoctions? Punch bowls? Hot toddies and egg nog, anyone?). Night No. 1 will go under the title “Begin With Gin” and feature a (brief) history of the spirit, some mixing basics, and two classic gin drinks from the early days, the Martini and the Martinez. A third, sour-style drink might lurk in the background, as well (gotta make use of those lemons we’ll be peeling). We could work vermouth into the session, but it really deserves a night of its own, so on Night No. 1 we’ll let gin take the spotlight — vermouth will be the back-stage manager, or maybe join the bitters and ice in the Greek Chorus. I’ll be tending the bar. Hendrick’s, Ransom Old Tom, Noilly Prat, and Martini Rosso will be present for tasting, not to mention a variety of orange bitters and Luxardo Maraschino, and, I suppose, olives…but not in my Martini! This entry was posted on September 4, 2011 by IJ Lauer in Dry Vermouth, Gin, Heron Social Club, Old Tom Gin, Orange Bitters, Spirit Tasting, Sweet Vermouth and tagged cocktail club, drink club, heron social club, martinez, martini, neighborhood.